The seminary programs in Ukraine restarted this year with Dr. Wilhelm Torgerson teaching three intensive courses up to December. CLMS has forwarded the funds we have on hand to support the seminary’s fall classes, but more is still needed. Although the world has tried very hard to keep them from their studies, the students were able to return to school with a newly appointed President, and a warm environment fueled by the coal fired furnace. We know all too well, that where there is good work being done in His name, it is there that the devil focuses his energy. He will try to get in between the Word and the recipient and place boulders of fear and doubt. We have seen the devil take advantage of opportunities, but thankfully the Lord also works in everything for His good. 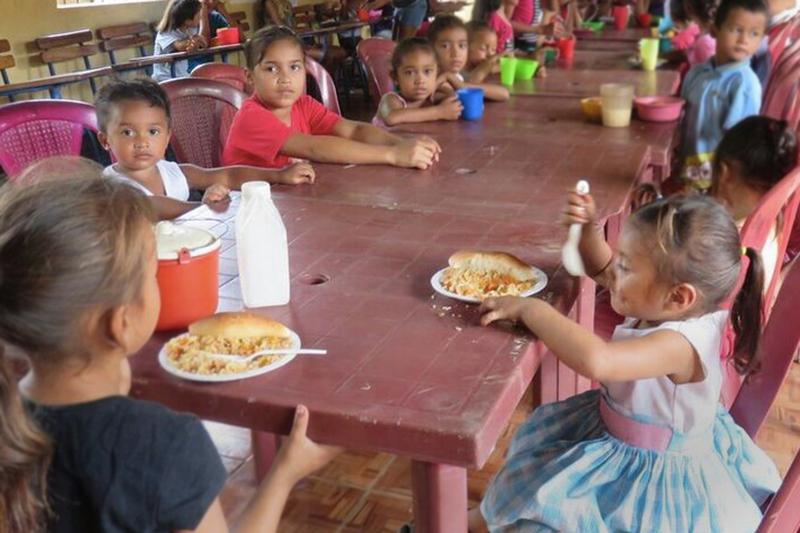 Nicaragua has faced challenges with the Children’s feeding programs, which are one of LCC’s most fruitful missions. Thanks to the CLMS projects you are funding for the “Bread of Life” and Deaconess support, the children are being fed physical bread and opening doors for the Gospel. In Thailand we are told that Pastor Suchat Chujit’s ministry is steady and strong. His church membership is small, but he has established several preaching stations and has welcomed new members into his adult bible study. Despite the obstacles presented in Costa Rica work progresses in the energetic and sustainable projects where there is youth work. Through the many programs focused on the development and strengthening of the faith of the youth, you are helping to prepare youth for outreach and providing them with the tools needed so that they are “not ashamed of the Gospel”. As with Canadian youth, your prayers are needed to keep the young hearts of Costa Rica focused on Christ so that they can continue to be conduits of the power of God who brings Salvation. Dr. Leonardo Neitzel provides an update on LCC Missions. KITCHENER, Ont. – At Concordia Lutheran Mission Society’s (CLMS) Annual General Meeting and Mission Festival, Sunday, February 8 at Faith Lutheran Church, almost 60 people heard the latest mission news from Lutheran Church–Canada (LCC), celebrated overseas mission activities, and heard first-hand of mission challenges in Ukraine. Rev. 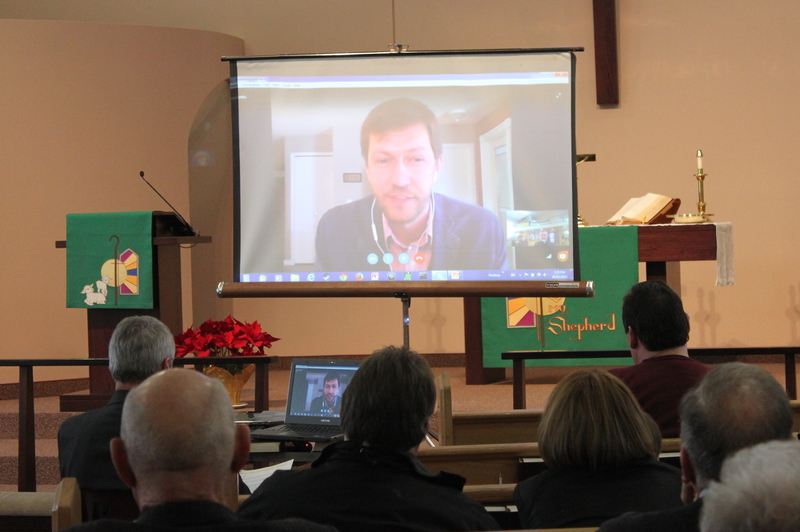 Dr. Leonardo Neitzel, Mission Executive for Lutheran Church-Canada, provided a detailed update on LCC’s mission fields including Ukraine, Southeast Asia, Canada and Central America. Sharing photos and stories Dr. Neitzel provided the audience with an engaging look at both the successes and challenges faced by mission workers and those they serve. 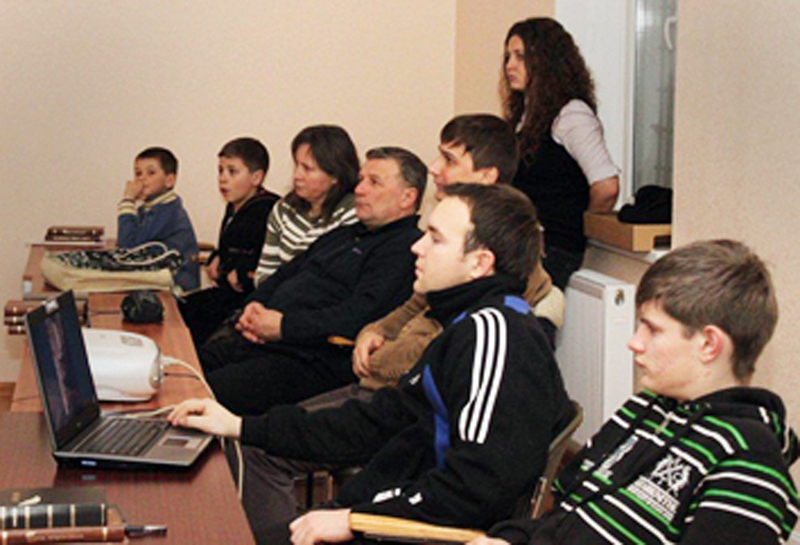 Attendees participated in a video chat with Ukrainian pastor, Rev. Alexey Navrotskyy, who is currently studying in Edmonton with the assistance of CLMS Partners in Mission. 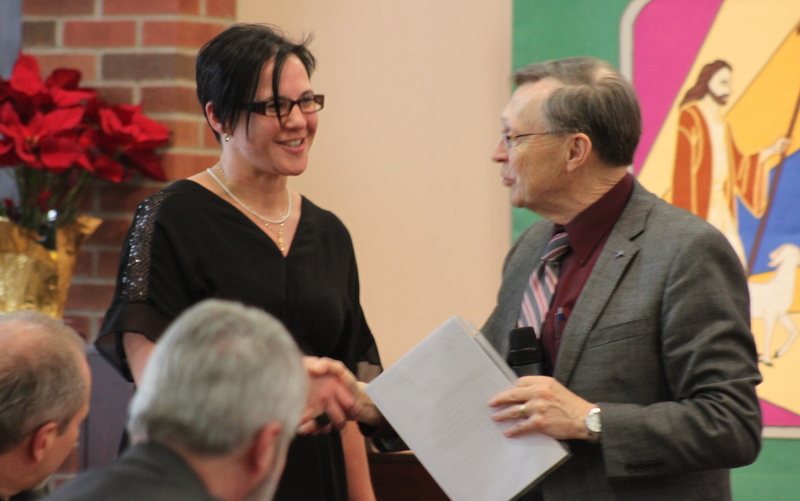 Lisa Jackson receives a certificate of appreciation from CLMS president, Rev. Cliff Haberstock on behalf of her mission team to Nicaragua. For the first time, CLMS presented Certificates of Appreciation in recognition of the many congregational and area teams venturing into the mission field. Recipients this year included Jane Ford and Lisa Jackson representing two Vacation Bible School teams and Reg Zotzman for an educational mission to supply laptops in Nicaragua. 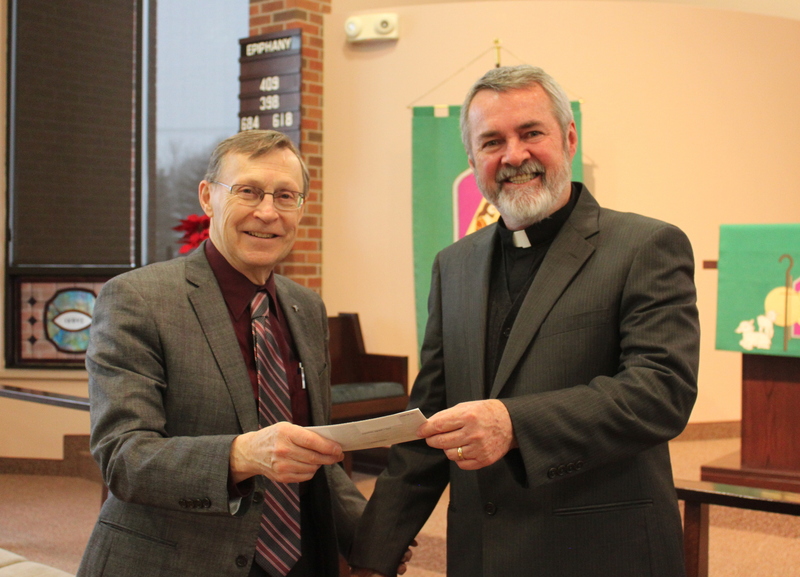 Since CLMS exists to support the mission and ministry of Lutheran Church–Canada, the afternoon concluded with the presentation of a cheque for $14,340 to Dr. Neitzel by CLMS president, Rev. Cliff Haberstock. The funds represent the final 2014 gifts from people across Canada who had supported CLMS projects over the past year. CLMS President Rev. Cliff Haberstock, hands cheque completing 2014 project commitments to LCC Mission Executive Dr. Leonardo Neitzel. GUELPH, Ont. 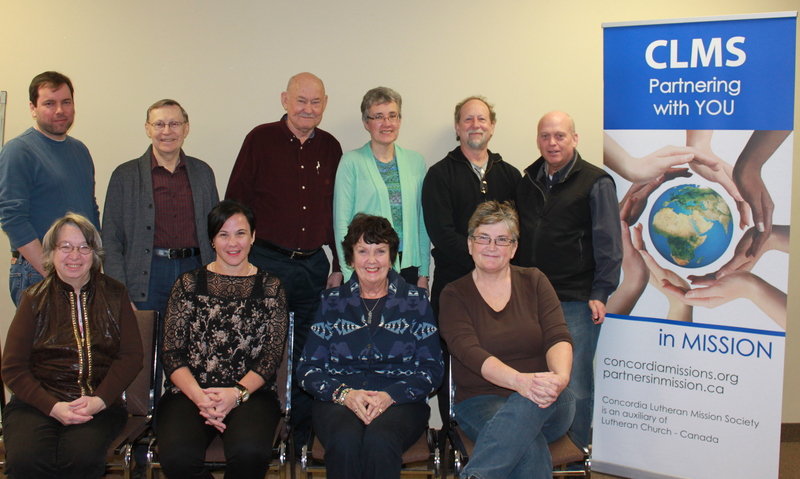 – At its annual face-to-face meeting February 5-7, the Board of Directors of the Concordia Lutheran Mission Society (CLMS) chose to support six new projects and renew 17 existing projects which set a 2015 project support goal of $146,000. This represents an 8 percent increase over the 2014 goal of $135,000 which donors from across Canada supported with their generous gifts. “We give thanks to God for the mission outreach support He provides CLSM through His people,” noted Rev. Cliff Haberstock, president of the society. 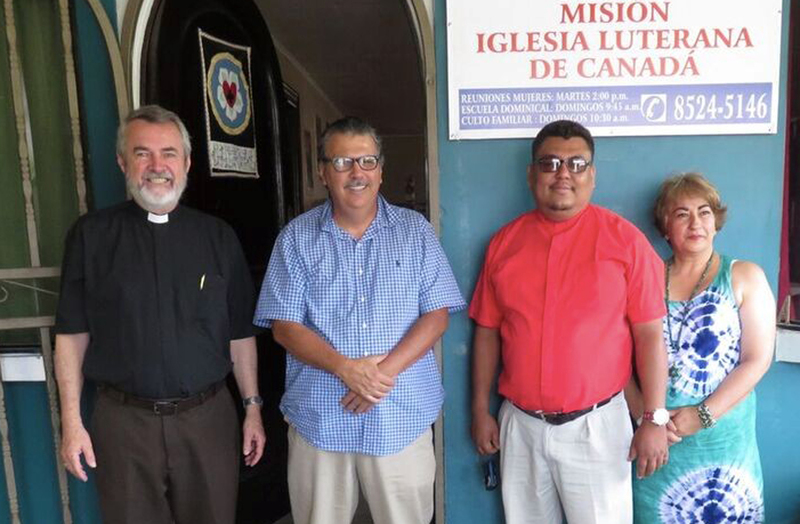 “We are humbled that we can be part of His mission of sharing the Gospel around the world.” CLMS raises financial support to assist the mission and ministry of Lutheran Church–Canada. The volunteer organization also welcomed two new board members, Julie Thompson of British Columbia and Lisa Jackson of Ontario. Details for the 2015 projects will be available soon. To receive email updates scroll down to the bottom of the page and check the “Notify me of new posts” box.